Lilian Bland’s career as an aviator may have been short, but she made a distinctive mark on aviation history. She not only flew Ireland’s first powered biplane, but was also the first woman in the world to design, build and fly an aeroplane. Her American counterpart, Amelia Earhart, was only 12 years old at the time. Lilian was born on 28 September 1878 at Willington House near Maidstone in Kent, England. She came from a long line of Irish descendants, dating back as far as 1670, and in 1900 her father John moved the family back to his native Carnmoney in Co. Antrim. Lilian became interested in photography and would often wander over Carnmoney Hill, her favourite place, where she would watch and photograph the birds soaring overhead. She was an unconventional young woman for the time, engaging in activities that were not considered appropriate for a ‘young lady’ in the Edwardian period. She dressed in breeches, smoked cigarettes and tampered with motorcar engines. She rode astride horses and took part in hunting, fishing and shooting activities, at which she was very skilled. By 1908, Lilian had established herself as a sports journalist and press photographer for London newspapers. During the summer of that year, whilst staying with friends in Scotland, Lilian spent most of her time watching and photographing the seagulls maneuvering in the skies above, and her fascination with flying increased. A postcard of Louis Blériot’s monoplane with its dimensions, sent to her from France by her Uncle Robert, further fuelled her aspirations in aviation. Lilian attended the first official aviation meeting held in Blackpool in 1909, where she took careful detailed notes of the measurements and dimensions of the aircrafts on display. She also observed the aviators in flight, noting that “they keep their heads to the wind and turn a corner by drifting round tail-first”. She read all the information she could in various books and magazines, especially Flight magazine and, at her late uncle’s well-equipped workshop, set to work designing and building her own plane. First she built a biplane glider, with a wing span of six feet, which she flew successfully as a kite. This encouraged her to start work on her full-size glider. She used bamboo, spruce, elm and ash, and, remembering the seagulls in Scotland, she steamed the ash to bend it into shape, emulating the slight curvature at the tip of their wings. Spruce was used for the ribs and stanchions, while unbleached calico was soaked in a mixture of gelatine and formalin to make it waterproof. The skids were also made of ash and the outriggers of bamboo. The engine bed was made from American elm and was fastened by wires attached to the upper and lower wings to keep it secure. The fuel tank was housed in the chassis and the canvas pilot’s seat was enclosed and secured by four straps to prevent the pilot from falling out. The controls were a bicycle handle bar. The finished glider had a wingspan of 20 feet and 7 inches, and weighed 200 pounds. Due to the doubts that were expressed to her about its flying capability, Lilian, with deliberate irony, named it Mayfly. Mayfly had its trial flight on the slopes of Carnmoney Hill, where Lilian had enlisted the help of four six-foot-tall, burly members of the Royal Irish Constabulary and a young lad called Joe Blain. All five hung on to Mayfly as the wind took it up into the air. The four constables promptly let go, leaving Joe to hang on and bring the glider back down to the ground. Lilian concluded that if Mayfly could carry the weight of five men, it could quite easily manage the weight of an engine. Lilian ordered a two-stroke air-cooled engine from the newly founded A.V. Roe Aircraft Company in Manchester for the sum of £100. After a delay in the order, Lilian, who was unable to wait any longer, travelled by ferry to England and returned to Ireland on the boat train with her new 20hp engine and adjustable-pitch propeller, much to the astonishment of the other passengers. She wrote in a letter to Flight magazine that “it fitted very neatly into a railway carriage and also an outside car”. As the engine was housed behind the pilot, Mayfly was started by Joe Blain, who stood between the tail booms and swinging the propeller. At first the flight wasn’t very smooth, with the plane making faltering hops at a short distance, but after several attempts it flew to an altitude of 30 feet and stayed in the air for a quarter of a mile. Lilian was delighted and in disbelief kept checking the wheel tracks on the wet grass to confirm that she had taken off. “I have flown!” she wrote in a letter to Flight magazine. 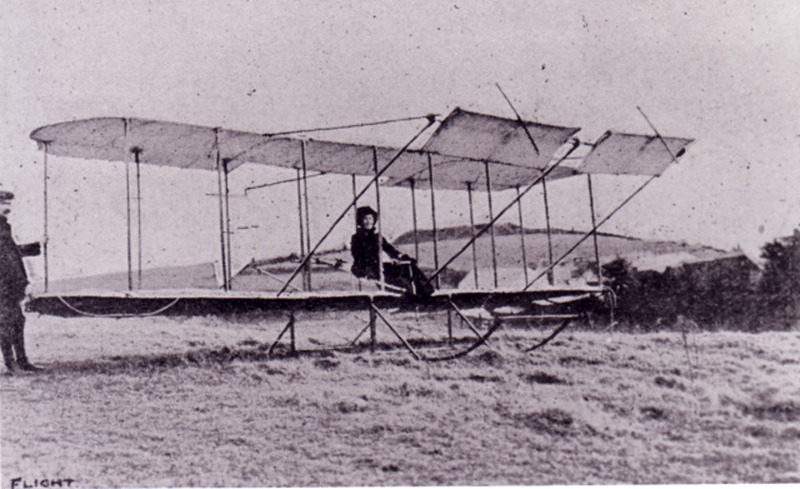 Lilian continued experimenting with further flights and planned to improve the design of Mayfly. She started a business offering her biplanes for £250 (without an engine) and gliders for £80, but this was short lived as her father, who had been worried about her precarious exploits, brought her a Model T Ford motor car. She taught herself to drive and became Ford’s first agent in Northern Ireland. In October 1911 Lilian married her cousin Charles Loftus Bland and emigrated to Canada. 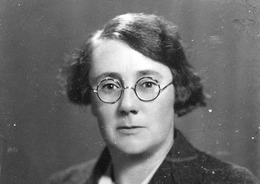 She returned to Kent in 1935, where she lived with her brother Captain Robert Bland until the 1950s when she retired to Cornwall. She died at the age of 92 on 11 May 1971 and is buried in the churchyard in Sennen, near Land’s End. Daughters of Ireland by Debbie Blake has been published by The History Press Ireland in August 2015. Flight Magazine: July 16th, September 10th, December 17th 1910.